This item comes with free shipping, handling, & insurance! This canvas comes in a gold frame with linen liner and brass title plaque. "Inside each of us is a longing for home. Even vacations have a tendency to lose their sparkle after a while and home is where we want to be. God made us that way and in the widest possible sense, it is a reminder to not get so comfortable here that we lose our desire to go Home. Yet, there are the times when it appears that a loved one went Home prematurely. Many have suffered through the loss of a child. The only thought that can bring hope at such a time is to know that going Home means running into the arms of Jesus. Tears of grief will eventually turn into tears of relief and joy viewed through that reality. There may not be a more comforting thought in this world than to know that Jesus went on ahead of us so that when we leave this earth, our very next breath will be used to run Into His Arms." Into His Arms copyright© 2007 by Ron DiCianni is prohibited from being copied. All applicable copyright© laws apply and are reserved by Ron DiCianni. 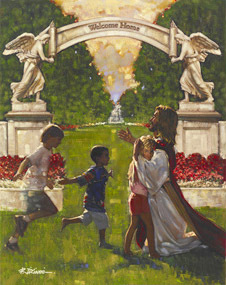 Ron DiCianni art, jesus in heaven, jesus with little children, pictures, artwork, art work, canvases, images, paintings, pictures, and prints of Into His Arms by artist Ron DiCianni for sale. 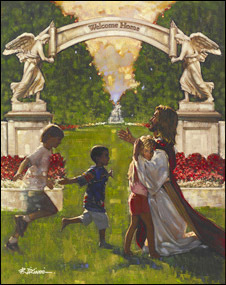 Into His Arms painting by artist Ron DiCianni can be purchased in art print or canvas form at special sale prices at Christ-Centered Art.